It isn’t every day that you get to walk into a distillery and take a sip of the good stuff straight off the tap. Well… the fine folks at Doc Porter’s do, but you get the picture. 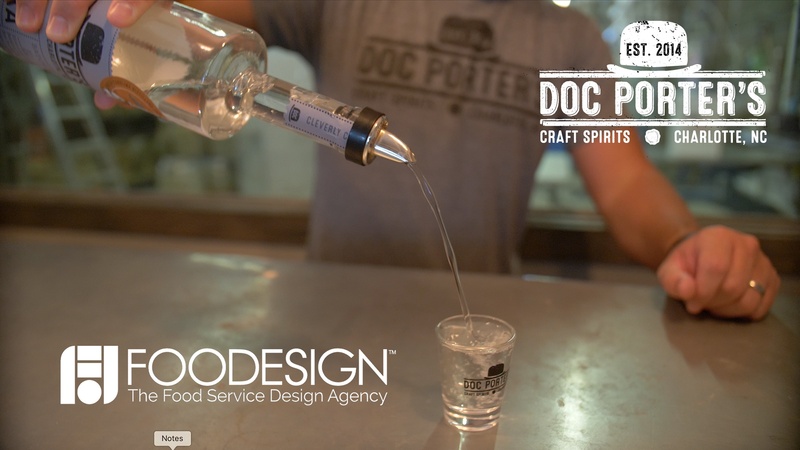 Doc Porter’s is a local Charlotte distillery, with a growing number of offerings including vodka, gin, bourbon, and now rye whiskey. Nestled snugly in the farther reaches of Uptown’s South End, Doc Porter’s is situated among a growing family of social-centric (read: drinking with friends) establishments, making the immediate area one of the best quarter-miles in Charlotte to spend a full night exploring. We had the good fortune to spend some time with the team at Doc Porter’s while filming a short piece about their approach to local, handmade craft spirits, and they were generous enough to step us through their thoughts on what it takes to be a part of Charlotte’s local food and beverage scene. Finding a way to differentiate yourself as a brewery or distillery is a significant challenge, and maintaining a legitimate “local” character (especially outside of branding and marketing) even more so. When I worked in a local Charlotte brewery, we often joked that the only “local” parts of many local beers and spirits is in the water that they use to brew their batches. Even with the relatively modern ease of distribution, there are only a handful of centers around the country that can source large quantities of grain to smaller businesses with any sort of consistency and affordability. So now every craft brewer and distiller has access to the same grains, which renders the idea of “terroir” (so crucial to the wine industry) relatively useless for otherwise-local grain-based beverages. That’s why it’s so impressive that Doc Porter’s has been able to wrestle back a bit of “true locality” from the jaws of extinction. That takes work. Doc Porter’s sources grain that has been grown within 40 miles of the distillery, and they go through about 3 tons of North Carolina grain per month. They also send their spent grain back to local farms to feed livestock, which is a fun close of the loop. To take full advantage of their local grains, Doc Porter’s purposefully avoids any technique that strips grain-qualities from the finished product. The result is character-filled spirit that lends itself more towards a neat slow-sipper than a quick dash to the refrigerator to find a mixer of some kind. And yes, the vodka, too. Check out our video below to get a bit more insight into Doc Porter’s, then make sure to schedule a tour and tasting sometime soon.